A smoke alarm is a device that senses smoke, typically as an indicator of fire. Commercial security devices issue a signal to a fire alarm control panel as part of a fire alarm system, while household smoke alarms, generally issue a local audible or visual alarm. Smoke alarms can only work if they are properly located, installed, and maintained. Roughly two-thirds of home fire deaths happen in homes with either no smoke alarms or no smoke alarms that work. 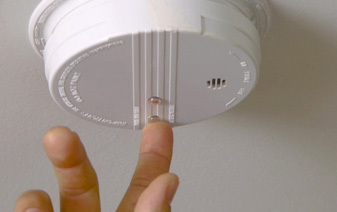 Smoke alarms with non-replaceable batteries are designed to work for 10 years. If the alarm chirps, warning that the battery is low, replace the entire alarm immediately. 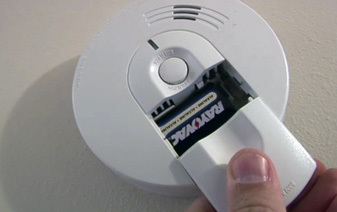 For smoke alarms with any other type of battery, replace batteries at least once a year. If the alarm chirps, replace the battery right away. If a smoke alarm does not respond when tested, it needs to be replaced. Gently vacuum the grillwork of your alarm to remove dust, bugs, and other debris that may prevent the alarm from functioning properly. The placement of smoke alarms is very important. Sleeping areas need the most protection. One alarm in a short hallway outside the bedroom area is usually adequate. Hallways longer than 30 feet should have one alarm every 30 feet. 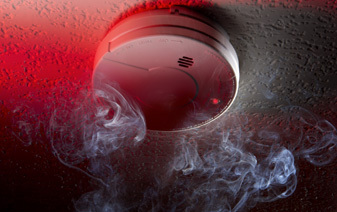 A smoke alarm should be installed on every level and in every room that will be occupied. Be sure to keep the alarm away from fireplaces and wood stoves to avoid false alarms. Also avoid installing alarms too close to heating ducts, air vents, and fluorescent lights. Place smoke alarms at the top of each stairwell and at the end of each long hallway. Smoke rises easily through stairwells. If you should put a smoke alarm in your kitchen, be sure to keep it away from cooking fumes or smoking areas. Proper mounting of a smoke alarm also is important. You can mount many alarms by yourself, but those connected to your household wiring should have their own separate circuit and be installed by a professional electrician. If you mount your alarm on the ceiling, be sure to keep it at least 18 inches away from dead air space near corners. If you mount it on the wall, place it four to 12 inches below the ceiling and away from corners. Keep them high because smoke rises. Never place them any closer than three feet from an air register that might re-circulate smoke. Don’t place them near doorways or windows where drafts could impair the alarm operation. Don’t place them on an uninsulated exterior wall or ceiling. Temperature extremes can affect the batteries. Would you like a free smoke alarms installed? If you do not already have working smoke alarms, or if they are over 10 years old, and you reside on the property where you are requesting the smoke alarms to be installed, please complete the Smoke Alarm Request form or call Station 1.